Framelock foldekniv med utstikkende tange for flipper funksjon. Grep av anodisert titan med motiv av bomber. Drop point blad i rustfritt S35VN stål med stonewash finish. Leveres med belteclip og camomønstret nylonbag. Åpnes lett og elegant på kulelager. The Ki5463A2 Bad Dog flipper by Kizer Cutlery is a collaborative project between Kizer and custom knifemaker Matt Cucchiara of Cucchiara Custom Knives. A good dog is a faithful companion that will guard your back in any trouble spot. The Bad Dog will do all that and more, with a fist full of attitude. A distinct recurve shape adds to the bite of the Bad Dog as it chases away evil and makes sure it never returns. 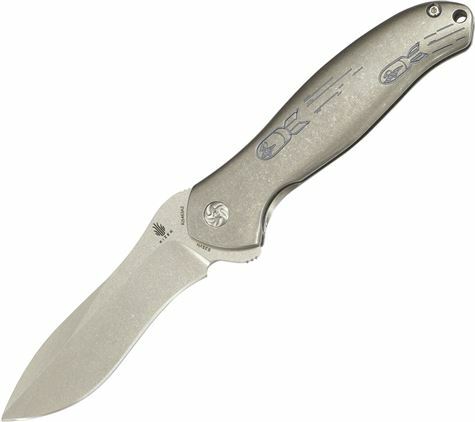 It features a 4.25" stonewashed CPM-S35VN blade with an organic recurved shape and jimped flipper tab. The bearing pivot system allows for smooth blade opening, as with all Kizer knives. The stonewashed titanium handles are some of the most comfortable we've ever held and also some of the most beautiful. The presentation scale features machined bomb engravings which Matt is well-known for. Every surface and every edge is contoured for comfort and gives the knife a very high-class look and feel. It features a replaceable steel lockbar insert that doubles as an overtravel preventer and comes with a tip up carry, milled titanium pocket clip.